Just days after publishing a blog post announcing a shift away from its struggling first-person shooter, LawBreakers, Cliff Bleszinski’s studio Boss Key Productions has announced a new Battle Royale-style game called Radical Heights. In Early Access starting tomorrow, April 10, the free-to-play online shooter looks like a mashup of The Running Man and an 80s back-to-school catalog. The Steam listing bills it as an “X-TREME” Battle Royale game and walks the line between Radical Heights looking like a parody of an attempt to make some quick cash in a break out new genre and an actual one. All microtransactions in the game will be for cosmetic items only, according to the studio, and all of them will also be purchasable with in-game currency. Like other Battle Royale games, Radical Heights will put 100 people in a Southern California-inspired arena and task them with fighting to the death. In addition to the campy presentation, the game’s other unique contribution to the genre is a mechanic where cash earned and deposited in ATMs carries over between matches. Rather than starting from scratch each time, players will have the financial nest egg established in previous matches at their disposal every time they start a new game. There’s also a game show mechanic with wheel spins and prize doors. The more money you earn, the more famous you get, which makes Radical Heights sound more like a Black Mirror episode about Battle Royale streaming culture than a true successor to the studio’s high concept, class-based shooter from 2017, LawBreakers. That game came out wedged hopelessly between a still very popular Overwatch and an ascendant PlayerUnknown’s Battlegrounds and failed to gain much ground, especially on PC, where the player-base is virtually nonexistent. Last Friday, Boss Key put out a blog post saying that the game had failed to find a big enough audience to make continued updates financially feasible. “We will continue to support the game in its current state, but we also need to focus on other projects with fresh creative leaders,” the post said. “We have been working on something new and we can’t wait to share more about it! It’s a passion project that we’re in complete control of.” It turns out that game was Radical Heights. 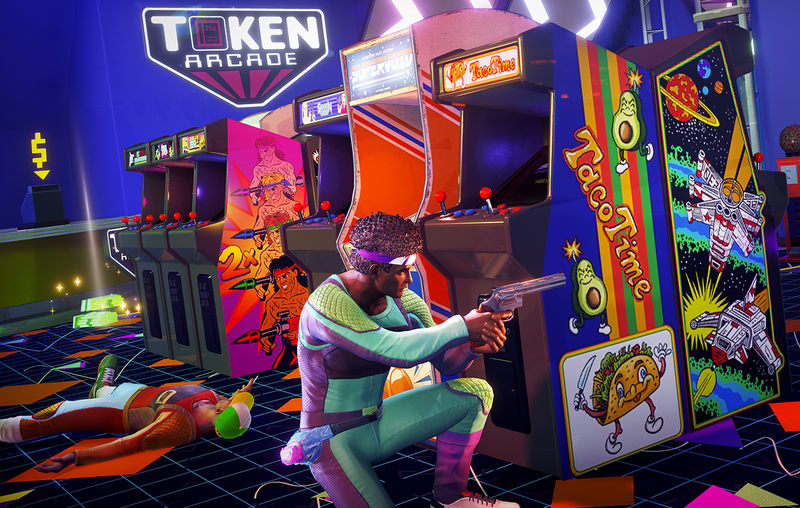 “This is a five month passion project for the studio as we’re creating and publishing the game entirely by ourselves,” said Zach Lowery, Radical Heights’ creative director, in a press release today, making it clear the pivot to this game led by Lowery is what the company’s blog post was alluding to last week. Boss Key was formed in 2014 by Bleszinski of Gears of War fame, who left Epic Games in 2012, and Arjan Brussee, who co-founded Guerrilla Games and helped oversee the Killzone series. Both developers first met at Epic Games in the early 90s, and it was to that studio that Brussee returned at the end of last year to work on a new project, which turned out to be Fortnite mobile. Fortnite, developed by Bleszinski and Brussee’s old studio, also struggled in its early days but became a household name after adding a free-to-play Battle Royale mode inspired by PUBG. Now, Fortnite is one of the most popular games on the planet. Radical Heights appears to have similar aspirations.